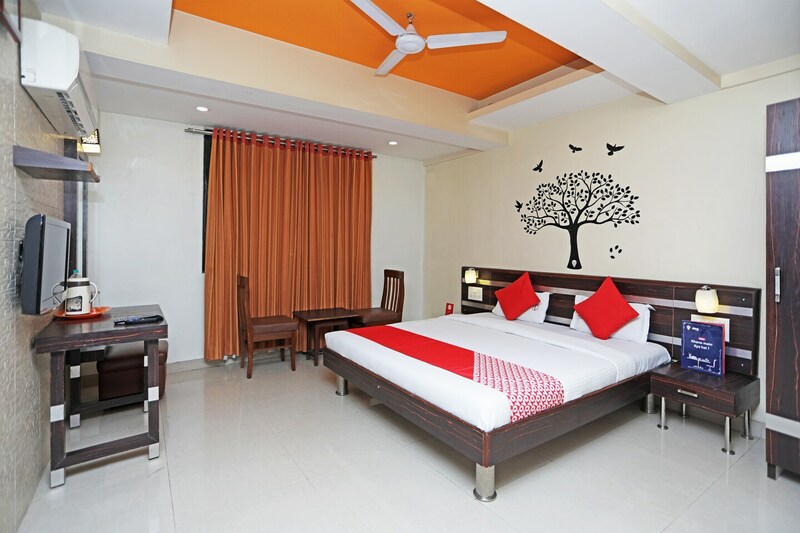 Situated in Shivaji Nagar, Hotel Swasti is a beautiful hotel with a simple dark grey external structure and a warmly decorated interior. The bedrooms at the hotel have white coloured walls and dark wood furnishings with one of the walls painted a pastel colour and another painted with an image of a tree and flying birds, making the rooms appear warm and comfortable. The rooms also have large windows that let ample sunlight stream in, thereby brightening up the place. There are a seating area and a banquet present at the hotel that the guests can avail during their stay. The hotel provides its guests with free Wi-Fi and power backup so that they can stay connected with the various social networking platforms and not miss out on any important updates. Other amenities offered by the hotel are a geyser, parking facility and a card payment option. Tourist spots such as Parvati, Vetal Hill, Atlantis Aqua, and Rani LaxmiBai of Jhansi Statue are situated in close proximity to the hotel.